Last year I had a goal to make gnocchi and I managed to fit it in just under the wire. (For those uninitiated, I make resolutions for Chinese New Year, not January 1 New Year, so I still have until Sunday to finish up my List.) I absolutely underestimated how much work goes into this potato-pasta morsel. I actually had to take a little break and have a snack it took so long. I’m sure as I got a little more comfortable rolling and chopping the dough I’d be quicker, but for a first run? It was crazy-labor intensive. Also, in retrospect, I’m sure this photo would have looked much lovelier if I had chosen a nice, robust marinara sauce instead of a cheesy white sauce. But I happened to have bacon and chicken and spinach and romano cheese in the fridge, so into the white sauce they went for an incredibly tasty dinner. Boil the potatoes in their skins, drain, cool and peel. Run the potatoes through a ricer, or just use the smaller-than-hashbrowns part of your cheese grater to get them into fine little pieces. Combine flour and salt. Gather potato mixture into a mound and make a well in the center. Break egg into well, and knead together a few times. Add flour mixture and knead into a smooth, firm dough. Break off pieces about the size of a tangerine and roll into long sausage shape about the width of your pinky finger (I have large hands, like, man-sized hands, if that helps you gauge this at all. Tiny handed people? Use your index finger instead). Cut into pieces about an inch long and roll each gnocchi over concave part of a fork. Coat well with flour (I put about a cup of extra flour in small bowl and just plopped each gnocchi in and swirled it around a bit) and set aside. When you have finished enough for your dinner, bring a pot of water to boil. Drop gnocchi into boiling water a small handful at a time and when they float to the surface (in about a minute or so), lift out with a slotted spoon. Serve immediately with your choice of sauce. Throw all of this (except the spinach) into a skillet and stir until bacon and chicken are cooked and onion is tender. Melt butter in small saucepan and add flour, stir into a paste. Add milk and salt and bring to boil, stirring constantly so it doesn’t burn. When the sauce starts to get thick and bubbly, remove from heat and stir in cheese. 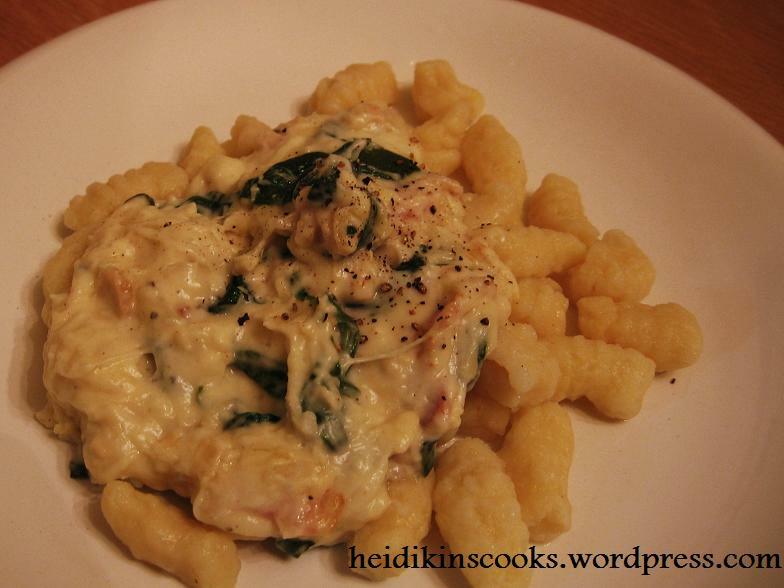 Add white sauce to bacon-chicken and add the spinach, when it gets all wilty, the sauce is done. The sauce recipe will most likely serve 4 people for dinner, to make it stretch add another tablespoon of butter, flour, and an extra 1/2 cup of milk to the sauce.